The companies and individuals victimized by these extreme weather events will increasingly be heading to the courts to try to be made whole, according to Daniel Kreeger, director of the Association of Climate Change Officers. And, he said, traditional “act of God” clauses in contracts might not fully protect the defendants in these suits as the consequences of climate change begin to seem less random. Kreeger, whose organization works with public and private employees who focus on climate issues, said this will be something that can be a drain on companies’ resources even if many or most of these suits are ultimately unsuccessful. In the financial services industry, investors will be the likely plaintiffs in future lawsuits, Kreeger said. Some of these suits are already materializing, he said, and they largely focus on the failure of companies to disclose climate-related risks to investors. For example, Exxon is currently fending off multiple suits from its investors who argue the company should have more aggressively written off its fossil fuel assets as the consequences of climate change become more clear. Kreeger said companies can get out ahead of these types of suits by disclosing more information than they’re required, such as when Chipotle announced it may no longer be able to sell guacamole in its restaurants if climate change threatens avocado harvests. Doing this also could earn them some goodwill with potential new investors, he said. “It says they’re managing [climate change] intelligently and they’re upfront and honest with me,” Kreeger said. At some point, companies may not have the option of disclosing their climate risks. Though it’s unlikely that the Trump administration will alter securities regulations to require more disclosure, international securities officials such as the G20’s Financial Stability Board are moving toward doing just that. In June, more than 100 companies—including the financial firms Morgan Stanley, HSBC, Citigroup, Barclays and others—signed on to a letter supporting the FSB’s actions on climate disclosures. Antonia Bullard, vice president of the investment research firm IHS Markit, opposes these measures, saying disclosure rules weren’t meant to be a proxy for policy makers to achieve environmental goals. However, she also said it would be foolish for companies to ignore investors’ calls for more information. 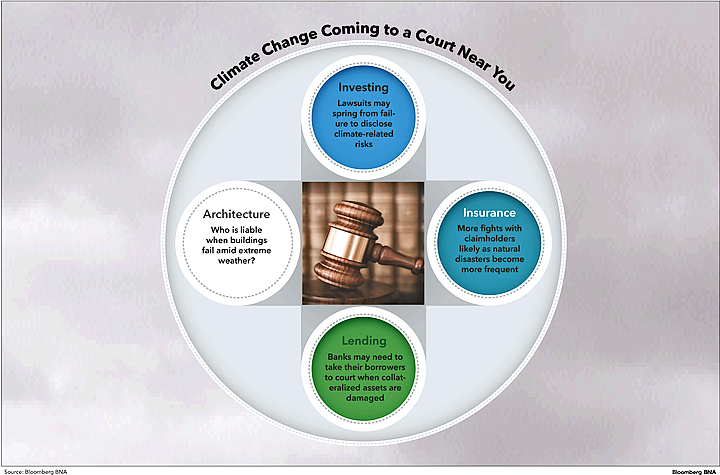 The banking industry also faces the prospect of more litigation in the future as a result of climate-related incidents, according to Kreeger. He says these lawsuits will likely take the form of a lender suing an insolvent borrower after collateralized assets are destroyed. For example, Kreeger said, a bank will have few options other than litigation if it lends a company money to build a factory that is subsequently inundated by a climate-triggered flood. “What legal recourse does a lender have if a large number of people have no hope of paying?” Kreeger said. Boston Common Asset Management, a firm that focuses on socially responsible investing, has been tracking the banking industry’s exposure to climate-related risks and has issued reports that found the industry isn’t as prepared as it should be. “A lot of lenders can avoid this type of litigation if they’re proactively looking at climate risk and do their initial due diligence,” Lauren Compere, the firm’s managing director, told Bloomberg BNA. And she said several firms are beginning to do environmental stress tests on parts of their portfolios that would be most affected by the consequences of climate change. Indeed, both Bank of America and US Bancorp have begun to incorporate climate change into their approach to overall corporate risk management. But Compere also said there’s another new trend that could end up spurring more lawsuits against banks: the current deregulatory environment in Washington. This is because deregulation may spur activists and other parties to try to accomplish in the courts what they can no longer achieve in the administrative sphere. Compere said insurance companies are much better at assessing long-term climate risks than bankers. But the insurance industry also has structural challenges of its own that, in some ways, may be more daunting than what the banking industry is facing, according to Stephen Weinstein, general counsel and chief compliance officer of the company RenaissanceRe, one of the largest providers of natural disaster insurance in the world. “Over the long term, we believe that climate-related exposure is growing,” Weinstein told Bloomberg BNA. It’s something that’s also receiving attention from the reinsurance industry, which serves as a financial backstop for insurers. Earlier this year, the Reinsurance Association of America held a conference on revising catastrophic risk models to take sea level rise and other effects into account. The problem, he said, is that most insurers are constrained by state and local laws that block them from adjusting the pricing of their products to reflect the full extent of this exposure, forcing them to carry risks on their books that they can do little to mitigate. He said lawsuits will be inevitable after a climate-related disaster when insurers are dealing with waves of claims they can’t handle. Controlling the pricing of insurance products “distorts the insurance market, but it also distorts land use decisions for literally millions of consumers,” Weinstein told Bloomberg BNA. However, correcting this problem is easier said than done for state regulators, who also have to balance the public’s need for affordable, readily available policies. Mike Kreidler, the top insurance regulator in Washington state, said the industry needs to get together with lawmakers, home builders, and others to create a new paradigm for how and where insurable structures are built. Taking this proactive approach would be preferable to addressing the problem after the worst effects of climate change have already kicked in, when insurers may have to refuse to cover existing structures in certain areas, he said. If that happens, Kreidler told Bloomberg BNA, the industry shouldn’t be surprised if it’s spending more and more time in court. Climate change poses a difficult and uncomfortable challenge for architects, according to Rachel Minnery, the head of built environment policy with the American Institute of Architects. She said architects have been raising concerns for decades that the buildings they design need to be more resilient. But ultimately, Minnery said, decisions about how to address potential climate-related hazards are up to their clients. And she said architects may not have much leverage with their clients if they’re operating in areas without strong, climate-conscious building codes. Ultimately, to avoid liability, Minnery said architects may need to be more vigilant in the future when it comes to documenting conversations with their clients on the topic of climate resiliency. But even if they have documentation and can demonstrate that their buildings complied with local codes, architects may still be subject to lawsuits after climate-related disasters that they’ll have to spend time and money fending off.